I am a huge fan of a-england polishes. The formula is always flawless and the colours are always interesting. I don't wear many red nail polishes as I feel it's a bit too mainstream - not that I'm exactly what you'd call cool, but I prefer to wear slightly more unusual colours. Having said that, a-england Perceval is an exception to the rule. It's an incredible shimmery red that looks like it's lit from within. It's stunning. 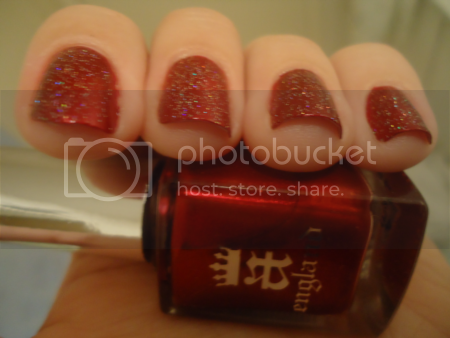 Most recently, I wore it with China Glaze Golden Enchantment, a gold holographic glitter top coat. I didn't manage to take a single photo that didn't come out a bit blurry, for some reason, but it still shows the colour of Perceval well, as well as showing how sparkly and holographic Golden Enchantment is.